The amount of knitting I do waxes and wanes, but this past summer and into the fall I definitely got my knit on, as they say on Mason Dixon Knitting. I thought I’d share the newly finished and current projects on Fridays until I run out of fun things to show. 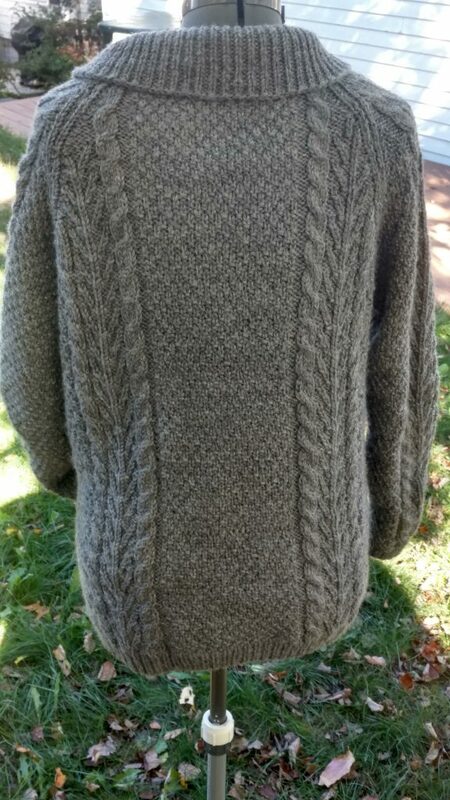 This is my new warm sweater made with a vintage Aran pattern I purchased on Etsy after eyeing it for a year. The pictures are a bit wonky, but you get the idea. There were a few stops and starts along the way. First, I ran out of yarn before I’d finished. Thank goodness Knit Picks had another skein of the same dye lot. Thank you Knit Picks! Then I found six buttons at JoAnn but needed seven. After a frantic internet search (The best JoAnn could do for me was to send me driving all over the state with no promise that other stores would have the extra buttons I needed.) I found matching buttons at Pacific Trimming in New York, and they sent them right off to me. 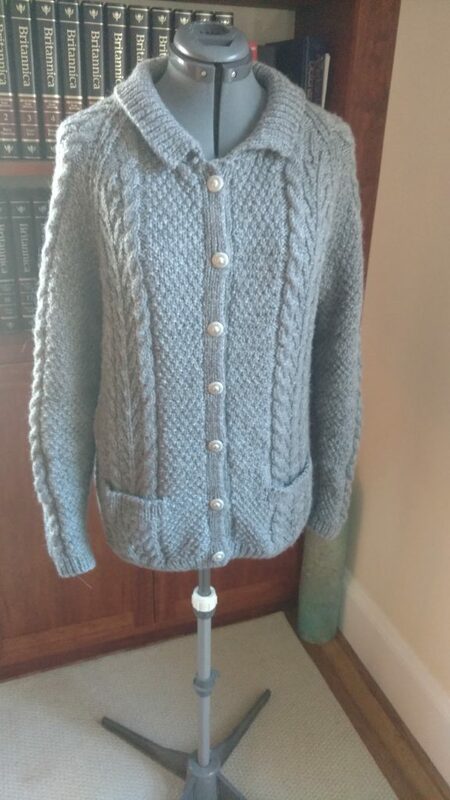 So now, just in time for cool temperatures I’ve got a vintage look, brand-new, superwash wool, Aran cardigan WITH POCKETS. I do love sweater weather. Wow, Sarah! This is really beautiful. You are one talented woman. Gorgeous and snuggly… enjoy those cool temps! So jealous of your ability! This sweater is stunning!